It’s coming up on the time of year when folks start thinking about spring cleaning and home maintenance. One of the top items pet parents should look at is the sturdiness of their fence to ensure that their beloved furbabies don’t get out and into some trouble. Every year hundreds of pets get out of their yards, and many of them are never returned (or worse). A site survey/fence assessment needs to be done to assess and analyze your particular fence, figure out what the weaknesses are and what it would take to repair or reinforce it. What type of pets are you pet proofing it against? Little or Big? Are they diggers? For me it was a Chihuahua, mini poodle, Great Dane and a Great Pyrenees. 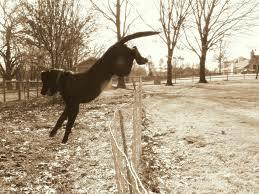 Different types of dogs can find different ways to get out of a fence. The poodle could get out from under the gap in between the ground and the pickets, and the Pyrenees could easily knock an old fence picket out with her paw. Mike says the most effective way to pet proof is creating a barrier at the bottom of the fence with stones. On his own fence, he took the stones his home was made of, trenched beneath the fence and lined them up between the fence posts, with part of the stone below the ground, part above. Creating a barrier of field fence or wooden pickets (as opposed to stone or brick) that run horizontally along the bottom of your existing fence, placing part of that barrier beneath the ground, and part above. Will this be a permanent or temporary fix? Temporary options would include lining the fence with embedded large rocks or bricks to prevent escape through digging and critters coming in from outside the fence. A permanent option would be what I did on my own fence at home – having concrete poured 12 inches down and 6 inches above, with metal fence posts. These kinds of permanent fixes are more expensive, but they are investments that will add value to your home when you are ready to sell it and will make it attractive to other caring pet parents. For ongoing maintenance, you should always check for loose boards or holes under the fence every time you are poop-scooping or put it on your To-Do list for when you change the AC filters. This is a simple thing you can do to prevent a potentially disastrous situation and the feeling of helplessness a pet parent experiences when they come home and Fido isn’t in the backyard. To help pet parents with fence maintenance concerns, Mike is offering a site survey for $55 for which he will provide a list of reinforcements/repairs and measurements along with amount of materials you would need if you want to DIY (or If you decide to him to do the repair, he’ll credit toward the work). If you want Mike’s help in pet proofing your fence, give him a ring at: 210.687.8971.